THe IPL Final.. Its ON! Before the finals, I had the idea of keeping a running diary of the entire match between the Chennai Super Kings and the Mumbai Indians, for the IPL 2010 trophy. I was told that some of my friends are getting together at another friend’s place, watch the game on the big screen. There were going to be some CSK and MI fans and this ensured there will be good deal of entertainment while watching the finals. Some of the characters that were purported to be watching the game are known to have a very short fuse but very ardent supporters of their respective teams. I reminded myself that I should take pictures and videos of the scenes as they unfold. T-20 mins: Ravi Shastri — Why does he need a microphone, seriously? The man can yell a comatose guyawake from his sleep. He questions the Mumbai crowd, whether they are ready to rock and roll, one last time? Does he know something that we don’t? I mean, its possible, even with all the goodhals going in the IPL, there will be IPL 2010. Or, does he think the world’s gonna end in 2010? I thought it was 2012.The captains are out for the toss. Really, really glad to see Sachin out for the toss. Says, “The hand is feeling fine. Will give my best.” Chennai win another important toss in the biggest game of the tournament. T-10 to T-0: Since youtube was streaming the direct IPL feed, we didn’t get to see any talking heads spewing out their predictions and analysis. Instead, the (in)actions from T-15 were on a loop. THRICE!!!! 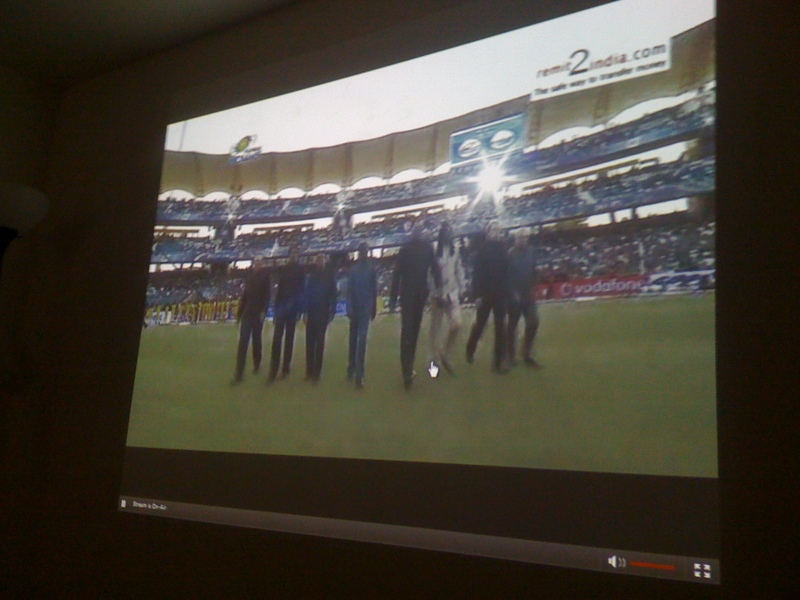 By this time, we had 10 people in the apartment to watch the game. 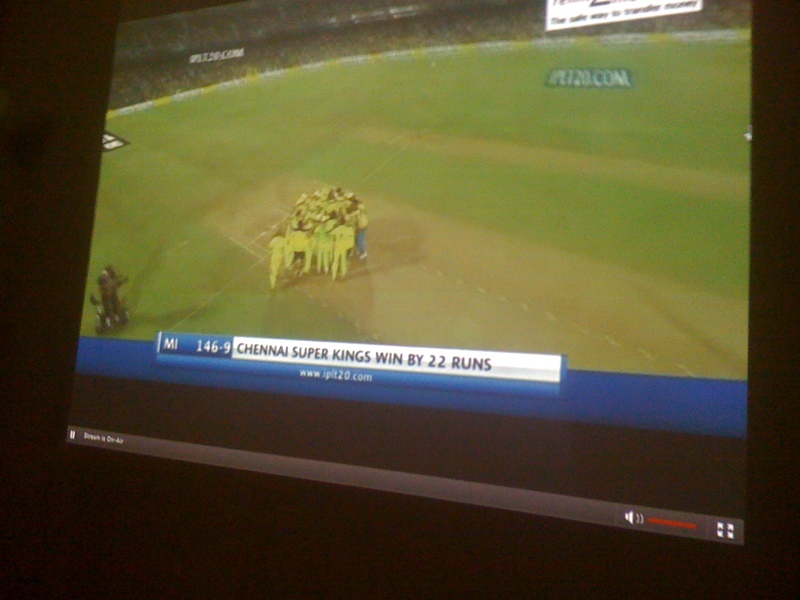 7 CSK fans, 2 MI fans, 1 CSK-fan- but-supporting-MI-for-Sachin (Matter). Promises to be a good viewing experience. 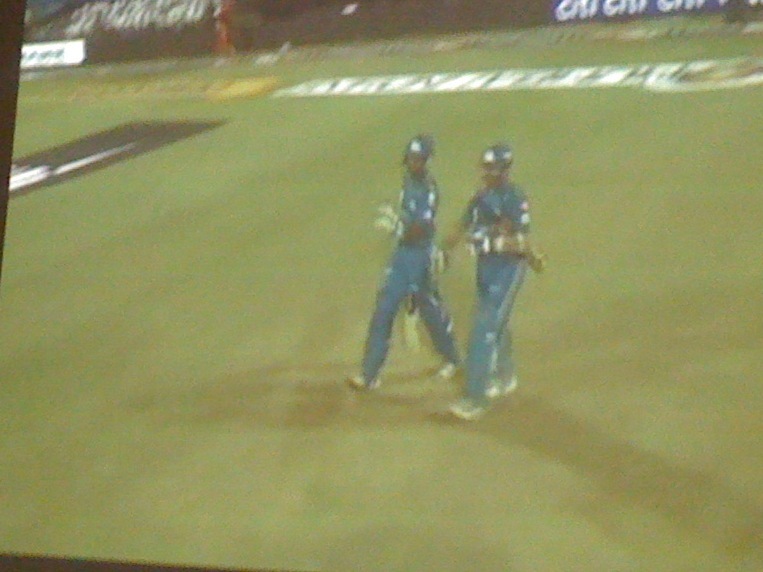 0.0 Overs: M. Vijay and M. Hayden walk out to the middle. Sachin has his boys in a huddle. The commentators are freaking out. The stadium is super-packed. At this time, one of the MI fans (Chaitanya) drops some knowledge about the really good looking D.Y.Patil stadium. “Dude, That’s a college ground!” I wish my college had such an awesome cricket stadium. I had mentioned in the preview that Bhajji will open the bowling. Yep, he’s got it. The turbantor. The obnoxious weed, according to Mattie Hayden, has got the ball in his hand, to open for Mumbai. The tension in the room is palpable as all the CSK fans want a solid start from the openers and some signs of life from the corpse of Hayden. 0.2 overs: Bhajji to Haydos — Appeal for LBW. Haydos giant stride outside off, perhaps saved him. 0.3 overs: Another huge appeal for LBW. Stuck outside the line of stumps. Hayden saved by his stride again. Of course, the MI fans complain that Rudi Koertzen has taken money. CSK fans prepare mentally for Hayden to get out any time. Very subdued start by CSK. Nothing flashy. Looks like they want to build a platform for their middle order to launch in to it. CSK fans start bitching about Hayden. Hold on boys, its gonna get worse. 2.2 overs: Harbhajan must be wondering what it would take Koertzen to give Hayden out LBW. That looked plumb. The MI fans are losing it. They have already descended to conspiracy theories. Don’t know who is more dead, Hayden or Koertzen! 2.4 overs: Finally, Hayden remembers he has legs AND feet. Comes down the pitch, meets the ball from around the wickets and launches it to the long-on boundary for SIX. Chennai fans forget immediately that Hayden has been sucking pretty much the whole tournament and expect him to go on to score a century or something. The call for the “Mongoose” rings out! 3.2 overs: Brilliant pick up shot for a six by Vijay, who has been quietly rotating the strike and takes the run rate above 5. Someone notes that he looks like Ricky Ponting while playing the shot. Even before he could finish it, someone else comes over the top and quashes it because Vijay does not shuffle as much as Ponting. Bravo! Hayden continues to struggle. I am tweeting while watching the game. I am wondering, whether it is good or bad for CSK if Hayden got out now. Prempanicker says its very good. Vijay hits a classy back-foot punch through the cover for a four, Hayden hits one off Malinga and CSK are trudging along. Hmm.. This is gonna put a lot of pressure on the middle order. 5.0 overs: Talk turns towards what’s a good score. I opine that 140 is a pretty good score as the pitch has something for the bowlers and has shown during the semis that batsmen can’t just go for big shots from the get go. Plus, the big occasion of the finals, makes 140 seem like 160. People are of the opinion that MI has such a long batting line up that CSK needs to get to 170+. But CSK are going at such a slow rate that its gonna be hard to get to 140 even. 7.2 overs: Hayden’s somnambulist struggle tells on Vijay. Gets under a fuller and slightly slower ball from Fernando. Intended shot over long on, goes to deep midwicket. Saurabh Tiwary settles under it and easily pouches it. Hayden continues in his merry ways and plays off four more dot balls. After 8 overs, CSK are 44 for 1, prompting this exchange. Me: Man, Hayden is playing like this is a test match. Madhu: I have heard he plays actually much more aggressive and faster than this in a test match. 8.4 overs: MI commit one of the many serious bumbling acts that would lead them to a loss. First, A slower from Pollard induces a top-edge from Hayden and the keeper takes an easy catch. 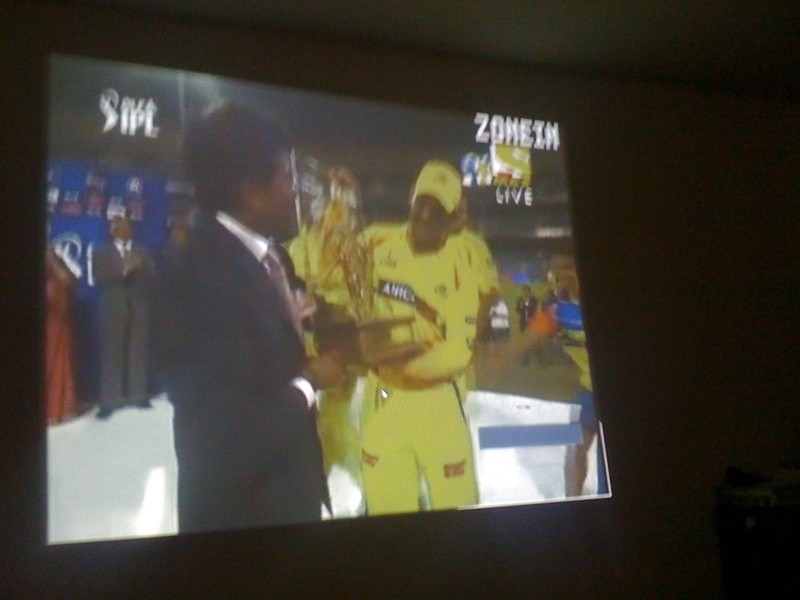 CSK fans celebrate. MI fans are not sure what to do! People are picking on the limited range in Badrinath’s game. Matter piles on by saying, “Machi, avam mogathala ee adala machi!” but goes on to tell a story from his school cricket game. During the under-10 cricket tournament, apparently, Badri pulled off a one-handed blinder on the field. The entire crowd watching the game, stood in unison it seems and gave him an ovation. Major goosebump inducing story! (Matter went to the same school as Badri). 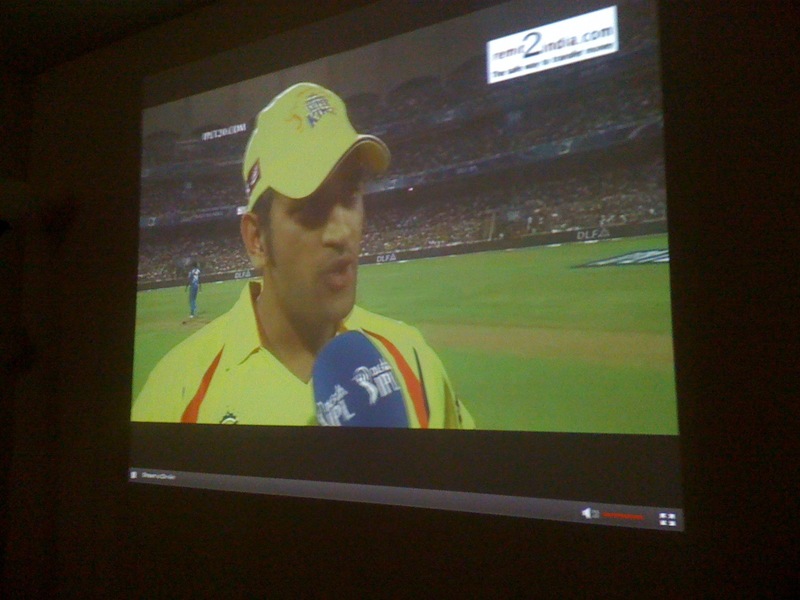 At this time, another guy watching the game with us, also confesses that his classmate was R. Ashwin. Funny part – this dude’s name is also R. Ashwin. Talked about the confusion created in the class when teachers call out for R. Ashwin. 10.3 overs: As if to rebut all the guys making fun of Badri’s game, he pulls a Sachin. Waiting till the last moment to upper cut the short ball from Pollard for a boundary. Very innovative shot, looks very elegant while doing it. Couple of veggie pizzas from Papa Johns. Sridhar pays for it. Good boy. When we decided to order, not many were interested. But the 2 large pizzas absolutely disappear. 11.2 overs Badri falls trying to push the rate. Gets too far inside a short ball from Fernando and holes out to Malinga at fine leg. 67/2. CSK are in a tighter hole. Need something big from the two batsmen on the pitch now, Dhoni and Raina. At least one of them has to be till the end of 20 overs. If not, repeat of IPL 2008. 12.1 overs: DHOONNIIIIIII…. One handed pull and the ball rockets over the onside boundary. Dhoni, Emm. Ess. Dhoni. Only Dhoni. 13.0 overs: Run rate at 6.50. (91/3) Some aggressive running and boundaries from Dhoni have pushed it up. Looks like the innings has got some momentum. These two need to play together another 7 overs. 9 runs an overs from here on out, gets CSK to a highly competitive 154. 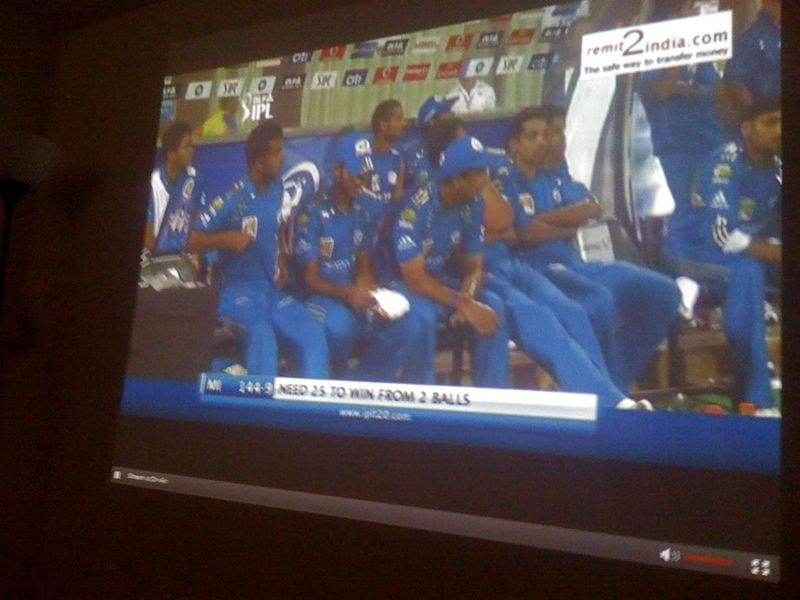 13.2 overs Second crucial mistake from MI. Its grade school cricket from MI fielders in the deep. Each calling the other to take the top edge from Raina’s attempt to pound the ball to midwicket boundary. BIG. BIG DROP! Ball drops harmlessly between the 2 fielders. You can actually see Zaheer (the bowler) mouth a few Behenchods! Sachin is livid. 15.2 overs Zaheer is the culprit now. Another top edge from Raina. Zak calls off the keeper (as he should) but the balls hits his fingertips before going down. Veins on Sachin’s forehead are about to burst. MI fans giving gaalis to Zak. Pulling their hair out! 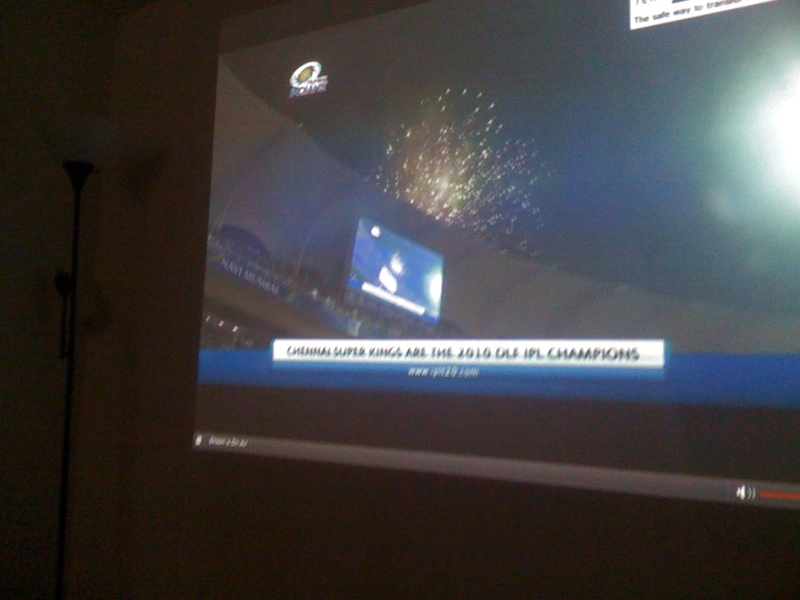 CSK fans out of the seats, jumping around, rubbing it in. Perhaps the big occasion is getting to MI players?? 17.1 overs MSD is out after a quickfire 22 off 15 balls. Fernando holds on to something finally. Dhoni through his swing almost before the full toss from Zak gets to him. Hits the side of the bat’s blade and goes to extra cover on the circle. 20.0 Thanks to some lusty hitting from Raina and Albie Morkel, and some poor death bowling by MI, Chennai get to a seemingly unassailable 168/5. Smoke break. Spoke to my father-in-law. He is painting the house while watching the game. Good American Man! He says, “We started slowly but looks like we made good towards the end”. Love the way he says “We”. He has adopted CSK as his team. Really good man. And adds, “Hey, What can I tell ya, Mumbai should have held their catches!!”. Cracks me up, totally! We are only few hours away from the final match of the IPL 2010 tournament. On the outset, it looks like a match-up of a team that’s been clicking on all cylinders and another team that has clawed and scratched its way through to the finals, with moments of inspired leadership. 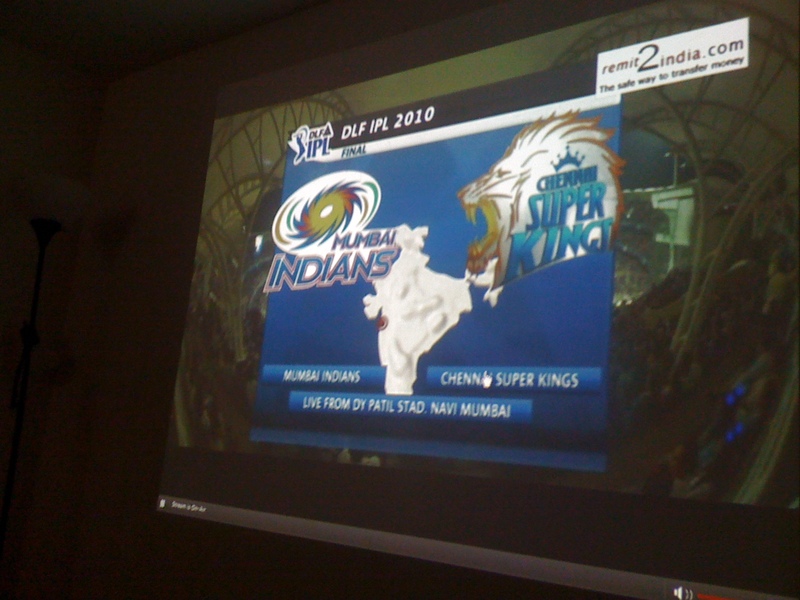 The previous two editions of IPL also featured similar matchups in the final games. In 2008, Chennai, which had the best batting line up of all, took on the Rajasthan Royals, who got on a run, motivated by their innovative leader Shane Warne . In 2009, it was the Deccan Chargers led by Adam Gilchrist. In 2010, Mumbai won 10 of their 14 league matches and crushed the Royal Challengers in the Semifinals and look set to bring home the trophy. Their batsmen have all produced at some point in the tournament, ably led by Sachin Tendulkar, who himself ranks #2 in the list of run scorers, as of today. Their batting has immensely been buoyed by the presence of capable local indian talents of Shikhar Dhawan, Saurabh Tiwary and Ambati Rayadu (of course, in addition to SRT). Add to this mix, Kieron Pollard and Dwayne Bravo. These two provide such balance to the squad as they are also uncanny bowlers, mixing up their slowers and yorkers. Of course, they are electric on the field as well. The Mumbai bowlers led by Zaheer Khan and Lasith Malinga have routinely provided the breakthroughs and bring tremendous amount of experience. Harbhajan Singh has opened the bowling, which I completely expect him to, today facing an off-color Mattie Hayden. The crowd will also be with the home team. They have looked the most complete team and it has showed throughout the tournament and deservedly, they have grabbed their spot in the finals. Chennai Super Kings were hanging by the proverbial thread and were in danger of not making the final four. Thanks to brilliant knocks from their middle order and a thoroughly brutalizing finish job by their captain Dhoni against the Kings XI Punjab in their last league game, they found themselves in the semifinals, which they won largely due to a fantastic performance by their bowlers. They have a few issues. Mathew Hayden has not performed for a long while now and has gotten the spot at the top of the order, mainly due to his reputation and partly to the fact that the replacement would be Parthiv Patel. He has seemed too aggressive at the start, which has been M.O. all through his career, but the pitches during this tournament have not been conducive for that. I fully believe Dhoni will keep him up top for the finals and I hope he re-calibrates his approach in the finals and decides to bide his time at the crease before he launches on. M. Vijay has looked in pretty good nick but has not had a big inning in a while. The fact that he has made in to the Indian team for the T20 World Cup (albeit due to injury to Sehwag) will do nothing but keep is confidence high. Raina, Badri and Dhoni have played pretty well up to the point. If Albie Morkel can contribute a bit with bat (if he has to), that rounds up a solid batting line up. The key for Chennai’s batting lies at the top. Hayden and Vijay need to set the platform for their middle order. Chennai’s bowling, which was its Achilles heel for most of the tournament, has been showing signs of turning it around. R. Ashwin opening the bowling has been a good performer and the arrival of Dougie Bollinger has given Chennai a genuine fast bowling wicket taker they had lacked all the while. Morkel has looked decent, without being very threatening and Jakati has done not too shabbily, as well. The 5th bowler has been a tough choice to make for Dhoni. If the pitch looked to aid spin, he has gone with Murali. But I think if the pitch for the finals looks to help a seamer, Justin Kemp should be brought in. Raina could chip in with a couple too. However, the elephant in the room is Tendulkar’s split webbing. He seems to think that he wouldn’t miss the finals but it would be tough to perform to his usual levels with 5 stitches in his hand, but I wouldn’t put anything past this man! If Tendulkar does not play, Huge edge to Chennai. If he plays and play well, Mumbai should start the game as favorites. Dhoni has shown his ability to handle big match occasions and has the experience of having played in the T20 World Cup final and the IPL final before (1 win, 1 loss). Cricinfo gives the edge to Mumbai based on some statistical facts. Who cares about facts? Not this CSK fan!